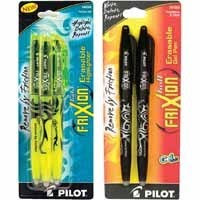 This week Walgreens has Pilot Frixion Pens and highliters on sale for $1.19 each. PLUS there is a coupon in the April Walgreens Coupon booklet for $1 off one pen. That makes the pen only $0.19 each. Be in the lookout when you buy these pens for a manufacturer rebate attached to the packaging. With this mail in rebate you can get $4.50 back by mail when you buy three pens for only $0.57!